A package arrived in the mail last week from my Craft Mom. I think you’ve all heard my references to Craft Mom (CM). The awesome lady who taught me how to properly quilt, knit and everything else in between is a reader of my blog! And she read about my Bermuda bag lust. Well, the contents of the parcel were a BERMUDA BAG!!! HURRAH!!!! 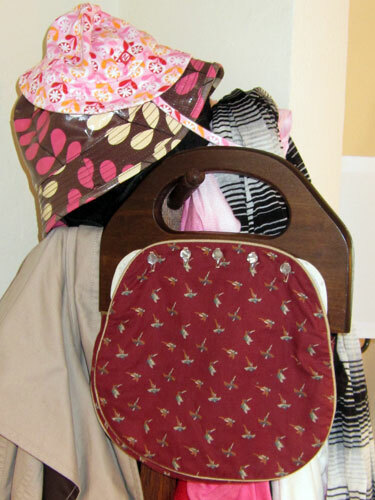 And not only is the Bermuda Bag super awesome, but it has a great cover to boot of flying quail on a maroon background. It doesn’t get more seventies Prep than THAT! But as wonderful luck would have it, HappyMae, the maker of lovely Bermuda Bag covers on Etsy let me know that she made another bird cover! Dreams do come true in Craftland! Maybe I will splurge and get a pink one to match my and the Peach’s bucket hats! Author Miss DottiePosted on September 9, 2009 Categories Oh my!!! I think you should find a pattern (or reconstruct one from the bags you have now) and make your own bag to go with that handle.